A different and unforgettable way to explore Ibiza. Are you on board? Good for any level, age or preference. Our excursions can be adapted to any need. Our boat is specially designed to offer our services and guarantee comfort and convenience. A life dedicated to Ibiza and the sea has taught us all of the secrets of the island, which we bring to our excursions. The unique features of our boat and our knowledge of the area allow us to reach magical hidden coves. We love our surroundings. We take care of the environment and respect every detail. 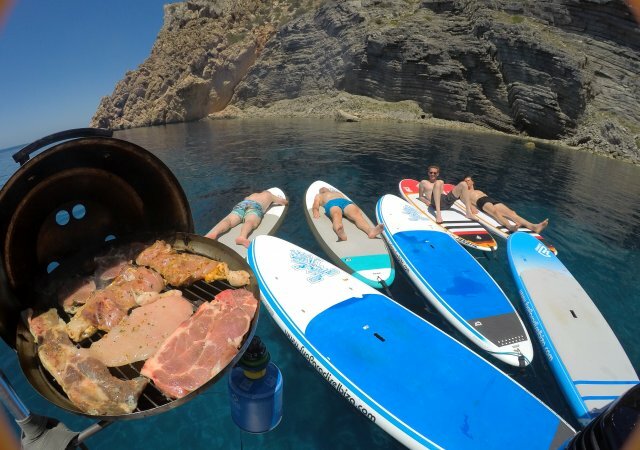 Paddle surfing, snorkeling, chilling out, drinks, freshly cut fruit, and even a barbecue on board! We do every activity in the right place and at the right time. Solárium, sombra, fruta fresca, bebidas, barbacoa... todo lo necesario para una experiencia involvidable. In addition to our plans, we personalize our trips for special events or to meet your particular requests. Quickly select all aspects of your excursion. 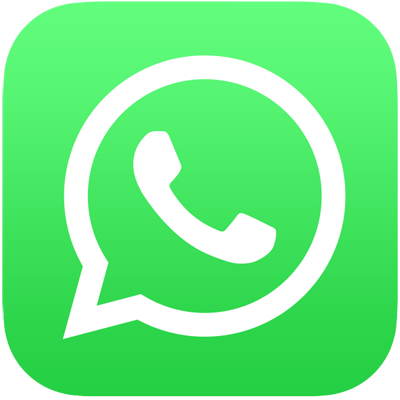 Enter your contact details, the route you want, the date, and the number of people in your group, and our crew will confirm with you as soon as possible. If you need a specific plan, feel free to contact us. Consulta nuestro calendario de disponibilidad para reservar tu actividad al momento. We sail through some of the most beautiful coves on the west coast of the island, such as Cala Conta and Cala Salada, choosing the course according to the weather and wind for optimal conditions. During the trip to our destination, we'll provide a basic paddle surf course for customers who have never done Stand Up Paddle (SUP), which we'll later do for an hour once we arrive at the coves. We'll also enjoy about 30 minutes of snorkeling with complete equipment in an incomparable setting. We offer fresh fruit and drinks on the boat so you can enjoy a fun return to the port. We also help these moments last forever with a copy of all of the photos taken that we offer our travelers free of charge. 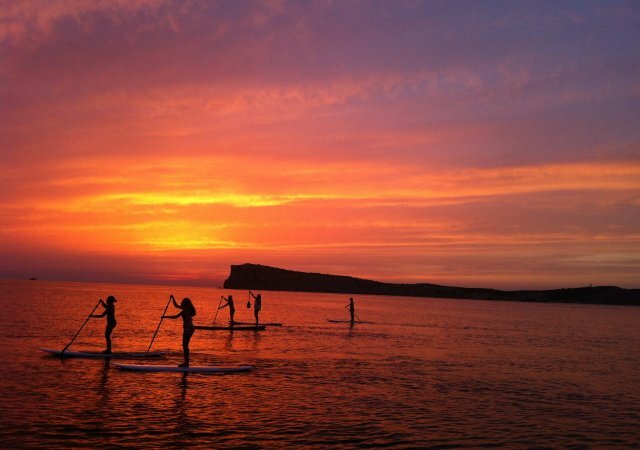 A magical and one-of-a-kind excursion for enjoying the famous Ibizan sunset. The highlight is to enjoy this moment on a SUP paddle board. That's why we provide our travelers who have never tried a Stand Up Paddle board with a basic course on our way to our destination. We crown this incredible atmosphere with fresh mojitos that fit right in with the surroundings. In addition, we help to make the experience last forever by providing our visitors with a free copy of all the photos taken during their excursion. A seven-hour dream in one of the most beautiful and most coveted places in the world. During this time, we will be around the best coves of Ibiza and enjoy its breathtaking surroundings, go Stand Up Paddle boarding (preceded by a basic course), and snorkel to discover the amazing local marine life. We offer a delicious barbecue on the boat with starters, salads, meat, desserts, and cava, as well as fresh fruit and drinks during the cruise. It's a perfect day that you will remember forever, and we even offer our visitors a free copy of all of the photos taken. La mejor combinación de deporte de mar, equilibrio, y bien estar, te la ofrecemos de las más variadas maneras que te apetezca, desde una excursión en barco y practica del Sup Pilates, desde clases privadas en la piscina de tu casa o en la cala más escondida de toda la isla donde tú quieras ir, con nuestro monitores especializados y conocedores de todos los secretos de la isla para hacer de tu experiencia algo único he inolvidable. CURSOS: -Barco. Duración total de la actividad 3 horas, 1 hora de SUP Pilates, el resto en traslados, snorkel y chillout con frutas y bebidas. Precio 55€ en los que te incluye: barco, Pilates, reportaje fotográfico, snorkel, bebidas, fruta. -En tu casa. Duración de la actividad sean 1,5 horas, en las que realizaras estiramientos calentamientos y Pilates. Precio 40 € en los que te incluye: material de sup, y sesión de Pilates. We went on a boat trip with SUP PARADISE IBIZA and had a great time. We visited a local cove which was a great place to learn and also had the opportunity to snorkel. Ruben, the instructor, was extremely helpful and we all had a great time. If you go to Ibiza, you have to contact Ruben from Sup Paradise Ibiza and do one of their excursions. Our experience was great! We were very satisfied. We went on their boat from 11am to 2pm from the port of Sant Antony. Paddle surf entering the coves....always guided by Ruben, who's very nice and you can tell he enjoys his job. We also snorkeled and then enjoyed a beer and freshly cut fruit on our way back to the port. The excursions costs € 55 / person and can be done in the morning or in the afternoon. Great experience!!! Worth repeating!!! My experience with Sup Paradise was incredible. It mixed the relaxation of a cruise in a traditional boat with the fun athletic activity that is paddle surfing. Also, after the cruise and paddling, they offer you fresh fruit and a drink on the boat! An amazing way to enjoy the island of Ibiza, especially its west coast! 200% recommended! They also make a super photo disc with their goPro so that you have all the best shots. I will repeat (over and over again). It was an awesome day, we had a great time, great atmosphere, hidden places in Ibiza and with fun water activities! Thanks for giving us a spectacular day!! You leave with the boat and sail to a beautiful cove while the crew explains how to use the paddle and row. When you get to a little cove, you go paddling for 1-1.5 hours in a group around the coast...Super fun!! Then you enjoy snorkeling in amazing places!!! They invite you to a drink and fresh fruit!! It's a must on your holidays in Ibiza!! My friends and I had a great day paddling the beautiful island north of Ibiza. Crystal clear water, a beautiful landscape surrounded us everywhere. The Paddle itself was complicated, but we were in safe hands at all times. Overall everyone had a great day and I highly recommend it. My first experience with SUP Paradise was with these people, and I must say that it was a delicious experience. I went with my family, two children included (10 and 4 years old) and had a great time. The kids enjoyed it very much. My older one learned how to paddle surf and my younger one got to drive the boat and ride on the board with one of the instructors. They took us to beach that was sheltered from the wind to facilitate the experience. The we paddled with the boards to shore and finally enjoyed some fresh pineapple after taking a dip. The guys are great, kind and very friendly. If I go back, I'll definitely do it again! Thanks so much, guys! Hi guys! I'm writing a little late but better late than never...sorry about that. I haven't been able to write before but have to say that when a place is good and the experience is incredible, it stays with you and it's unforgettable! Well, I was with my partner in Ibiza last July on vacation and surprised him with paddle surfing and snorkeling with this company, SUP paradise Ibiza, for his birthday. The guides and the atmosphere, the beaches, the tour of the coves, the water, the fish...Unbeatable! His patience and experience made us feel super safe and he was so friendly it was like we had been friends forever. A fantastic day! 10/10! Definitely worth repeating with a good group of friends. Thank you! I loved every minute of it. My girlfriend and I were there for the 15:00 trip. We went to quiet bays outside of San Antonio (passing the bars set up on the way) and then learned to SUP for about an hour, it was incredibly fun. And, considering we were all beginners, less than twenty minutes away we were all on our feet paddling. We then went snorkeling and finished the trip with a beer and some snacks on the boat ride back. I loved it! Good exercise! So much fun!!! It's worth giving it a try! Also, you get some great photos that you can have for souvenirs. The tour of the different coves and Cala Bassa is great! And the guides are very, very nice! Greetings from Galicia!